Fashion references to anything that is the current trend in look and dress up of a person, especially in clothing, foot wear, or accessories. Fashion modelling is a trendy job and people think that it's very easy to do and all that matters is only with the appearance. But sometimes modelling can be dangerous too, especially when it comes to cat-walking. 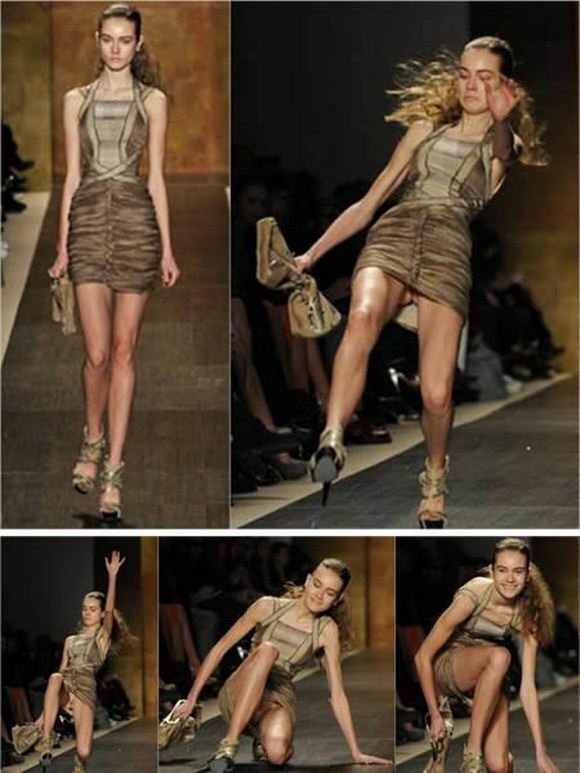 The catwalk can be a dangerous place for high heel wearing anorexic models, as these pictures clearly illustrate. Apparently walking is the greatest job hazard for these women. 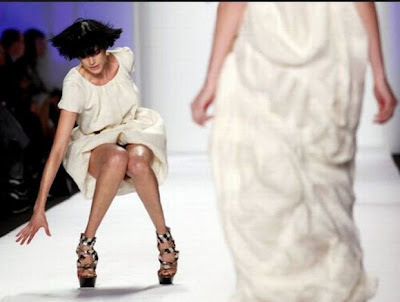 Anyway, in the honor of Fashion Weeks from all over the world, here we have collected photos of some of the models stumbling, tripping and flat out falling while performing cat-walk. 1. Sept. 11, 2006 file photo, a model trips and falls during the Proenza Schouler spring 2007 runway show during Fashion Week in New York. 2. A model presenting a creation from designer Amaya Arzuaga's Spring/Summer 2012 collection trips during Cibeles Madrid Fashion Week. 3. A model trips after losing a shoe on the runway at the Bebe Black Collection fall 2012 fashion show during Style360 at Metropolitan Pavilion on February 14, 2012 in New York City. 4. 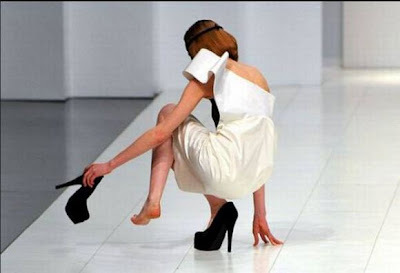 A model try to keep her balance during an Autumn/Winter fashion show by Maria Escote at the Madrid's Mercedes Benz Fashion Week, in Madrid, Saturday, Feb. 4, 2012. 5. A model falls on the catwalk during a rehearsal before the Christopher Kane 2012 Autumn/Winter collection show during London Fashion Week. 6. Models present a creations from the Venexiana Spring/Summer 2012 collection during New York Fashion Week. 7. A model falls while presenting a creation by fashion designer Miguel Vieira as part of his Autumn/winter 2012 fashion collection during Lisbon Fashion Week. 8. A model stumbles as she presents a creation from the J. Mendel Fall/Winter 2012 collection during New York Fashion Week. 9. A model trips while presenting a creation from the Burberry Prorsum 2011 Spring/Summer collection at London Fashion Week. 10. A model is helped by a spectator after she fell while presenting a creation by Georgian designer Irakli Nasidze during Georgian Fashion Week in Tbilisi, March 26, 2010. 11. 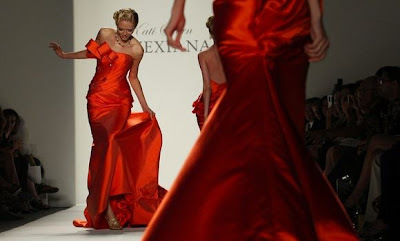 A model presents a creation at the Zac Posen Spring 2009 collection during New York Fashion Week. 12. 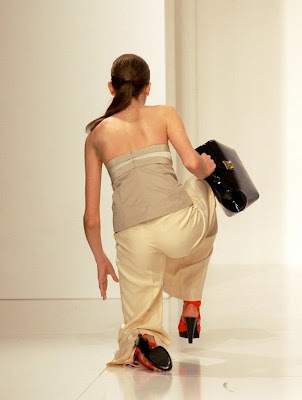 A model loses her shoes on the runway during the Matthew Williamson fall collection 2007 show during New York Fashion Week. 13. 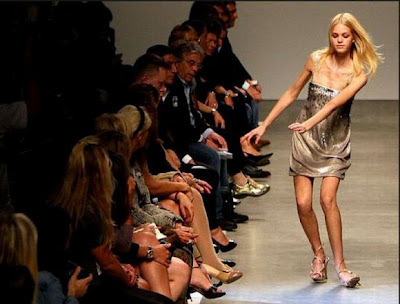 Model trips on runway during Sass & Bide's Spring Collections 2007 fashion show in New York. 14. A model stumbles on the catwalk as she presents a creation from the Mulberry 2012 Spring/Summer collection during London Fashion Week. 15. A model stumbles as she presents a creation at the Prabal Gurung Fall/Winter 2011 collection during New York Fashion Week. 16. Model 'Emerald' tumbles while showing off British designer Vivienne Westwood's Red Label fall/winter at her show at the Cafe de Paris, on the first day of London Fashion week February 21. 17. A model falls as she presents a creation from designer Miguel Palacio's Fall/Winter 2012 collection during the Mercedes-Benz Fashion Week in Madrid. 18. A model nearly falls as she presents a creation by Chinese designer Qi Gang during a fashion show at China Fashion Week for Spring/Summer 2012 in Beijing October 27, 2011. 19. A model falls while presenting a creation for the Seventh Hosa Cup China Swimwear Design Contest during China Fashion Week in Beijing, March 28, 2011. 20. A model falls while presenting a creation for Beijing Institute of Fashion Technology and Taiwan Shin Chien University Graduates Collection during China Fashion Week in Beijing, March 25, 2011. 21. A model falls as she displays a creation as part of Versace Spring/Summer 2012 women's collection during Milan Fashion Week. 22. 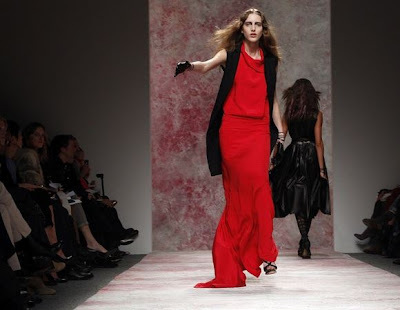 A model falls down while she presents a creation from Cavalera's collection during Sao Paulo Fashion Week Winter 2011. 23. A model falls as she displays a creation as part of Mila Schon Spring/Summer 2010 women's collection during Milan Fashion Week. 24. A model falls while presenting a creation from designer Alberto Rodriguez's spring/summer 2010 collection during a fashion show in Mexico City. 26. 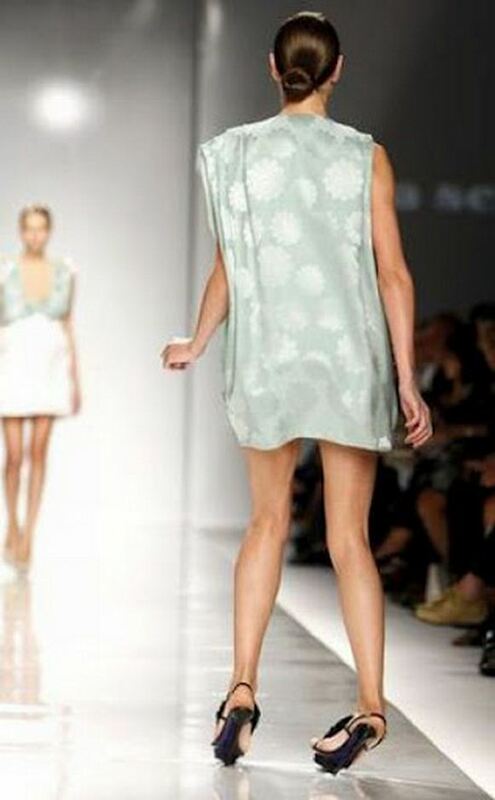 Fashion model Monika Jagaciak falls during an runway show. 28. Spanish model Laura Sanchez kneels on the floor after stumbling during Vitorio & Luccino's fashion show in Madrid September 6, 2000. 29. A model falls as she presents a creation from Peter Som Spring/Summer 2009 collection at New York Fashion Week September 8, 2008. 30. A model for designer Oscar de la Renta takes a tumble onto the runway during the presentation of the Oscar de la Renta Fall/Winter 2004 Collection in New York, February 9, 2004. 31. 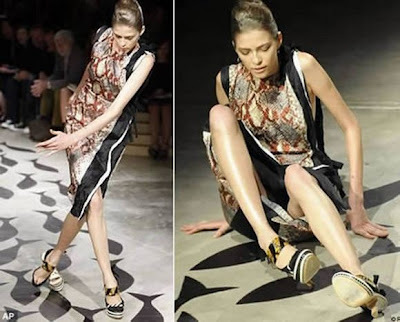 A model falls down during the fashion show trademark Forum, summer collection during the Sao Paulo Fashion Week in Sao Paulo, Brazil July 14, 2006. 32. A model falls during Prada's Spring/Summer 2009 women's collection at Milan Fashion Week September 23, 2008. 33. A model falls during the Zac Posen 2008/2009 fall collection show during New York Fashion Week February 7, 2008. 34. A model slips on her gown and falls to the catwalk at the end of Italian designer Donatella Versace's Autumn-Winter 2002-2003 Haute Couture collection in Paris July 8, 2002. 35. 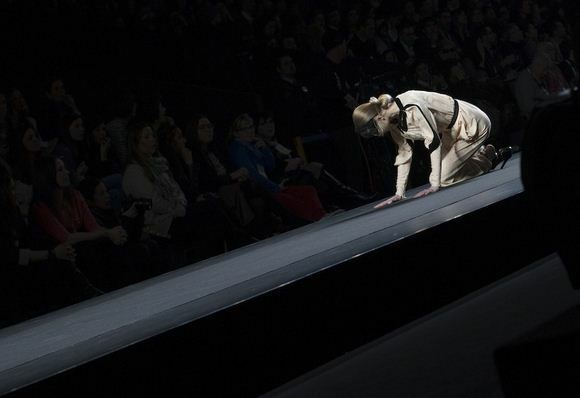 A model slips during Milan Fashion Week. 36. In 1993, a giggling Campbell falls off 10-inch platform boots at Vivienne Westwood's runway show in Paris. 39. A model falls during fall after walking onto the catwalk at the Dior 2008 show, with extremely uncomfortable high inch heels. 41. Famous fashion model, Alexandra Tomlinson fell on the Chanel Couture runway in Paris on January 27, 2009.